Born in Wels / Upper Austria, in the year of the ‘Snake’, under the sign of Virgo with ascendent Aries. All that happened a long time ago, in 1953. The war was already some years over, the 'pill' was developed and applied for a patent but not available until the early 60tis and therefore I grew up in a big family including a grandmother. I was eldest of 5 children and we were educated in a, probably for the time being the 50tis and 60tis, unusual and fairly free manner. My father's proverbs: 'You got brain - go and make use of it' 'You are Herta Ingrid K., be proud of it' and his socialist way of living and thinking with which he influenced his kids, followed me a lifetime. The artistic gift was laid into my cradle, being the daughter of a mother who herself is quite a talented artist (she made fascinating drawings) and a singer, though she made use of her talents only privately at home. During my gymnasium years in a private girls school, my artistic talent was promoted by art exhibitions in this school as well was my writers-talent by sending my stories to various youth-competitions where I also won some credits. Influenced by the students movement of 1968, I became a rebellious young girl who tried to live her own way from the age of 17 onwards - only mentally supported by my parents. For the financial support I had to care by myself. Later on I attended a evening school making the exames needed which allowed me to study and afterwards I moved to Vienna. 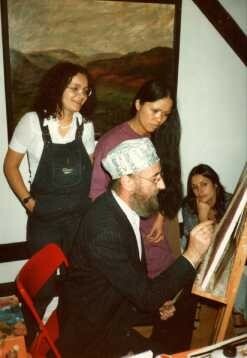 In Vienna I started painting and sculpturing and met artists like Ernst Fuchs, Michael Fuchs, Friedensreich Hundertwasser and Alfred Hrdlicka who influenced me through their technique. In Reichenau / Rax at one of the painting-seminars organized by Wolfgang Männer (teacher: Susanne Steinbacher, Brigid Marlin and Ernst Fuchs) I met the british artist Adam George Phillips, who became later my husband and the father of our son Benjamin. 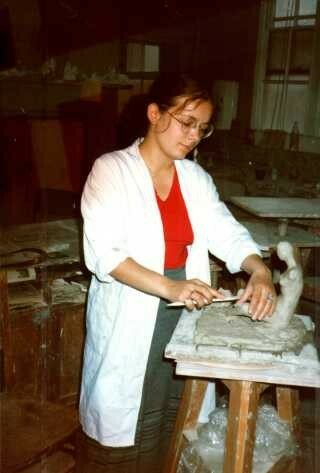 I went to England to attend art courses in the Camden Art College, which doesn't exist like this anymore. It is now the Camden Art Center in London which has improved a lot and offers now also accommodations for artists in residence. 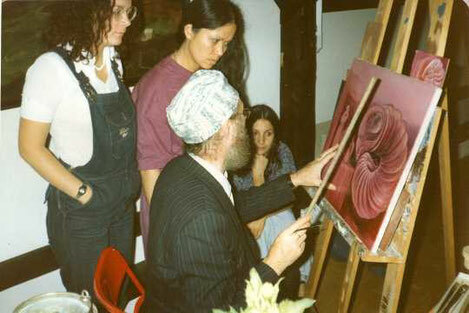 During the summers I made painting-technique courses in Austria with Ernst Fuchs, who taught the ‘Altmeisterliche Mischtechnik’. Back in Vienna I worked in 1983 with other artists by order from the ‘Viennese Festival Commitee’ for the exhibition ‘Zeit der Puppen’ in 1984. We produced roughly 320 life-sized, dressed dolls which were put up in all parts of the inner city of Vienna. The faces and some bodies of this dolls were taken in plaster, mainly of politicians and artists of this time. In 2002 I moved to the little village Burgkirchen in the Innviertel in Upper-Austria and slowly started absorbing the inspiration of this rural area. I decided in 2005 to stop working for the TV-broadcast all together, focusing from then mainly on painting and other artwork as well. The links to other websites are meant for additional information and do not necessarily reflect my own opinion.